It might seem strange that someone who has never played a typical Pikmin game (despite picking up Pikmin 3 for my Wii U) would have been excited to try Hey! Pikmin, but that’s the case here. The reason being, this 2D outing reminded me strongly of another 3DS game, Chibi-Robo! Zip Lash, which I greatly enjoyed. There are two questions with Hey! Pikmin then. 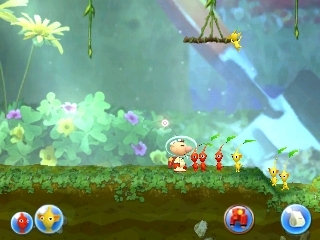 Is it more than a clone of Zip Lash and does it do a good job of translating the Pikmin appeal into a portable adventure? Let’s get one thing out of the way, there is no grand story motivating Captain Olimar on his quest. He’s traveling home when he warps right into an asteroid field, damaging the Hocotate and sending it plummeting to a nearby planet. While Olimar and his talkative mechanical co-pilot the S.S. Dolphin II survive intact, the rest of his ship isn’t so lucky. It’s completely out of fuel, so Olimar sets out to find a substitute fuel source. Remarkably, the Dolphin II picks up a signal from an energy called Sparklium (depicted like a glowing yellow or orange acorn in game), and with 30,000 of it, the Hocotate will be shipshape once more. Best of all, the planet is rich with another peculiar resource, the plant like minions known as Pikmin! Blowing his whistle and mustering his troops (or slaves, depending on how dark you want to look at it) Olimar begins his journey to get back home. 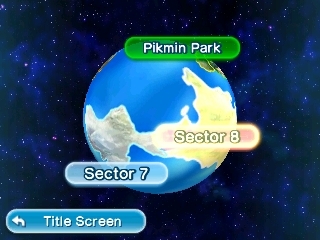 The game itself is split into various sectors, each of which have several areas (including secret ones you unlock with alternate exits) as well as boss fights. 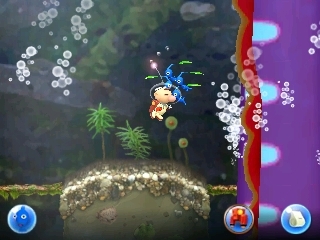 Each of the early sectors introduces the special uses for different colored Pikmin (Red is fire proof, Blue can safely travel in water, Rock can shatter crystals etc.) and most sectors also have a theme. The first sector, Brilliant Garden, plays it safe with lots of plant life and few hazards, while Sector 4, Ravaged Rustworks, is composed of hulking mechanical devices. Each sector stands out from the rest, though some themes do get reused, such as cavernous underground labyrinths or underwater trials. The diversity of the stage design will keep you on your toes, but more strategically important are the Pikmin you find within. For example, say that you’re in a fiery stage with scorching flames blocking your way. If you have Red Pikmin, they will safely stomp on the flames, smothering them so you have a path forward. But what if you have Blue Pikmin instead? Well, that likely means you’ll have to find an alternate path through water to progress. Some of the most clever areas turn your expectations on their head, such as one in Ravaged Rustworks where you are completely bereft of Pikmin until halfway through, and then once you find some, you have to work your way back to the beginning to reach the exit. 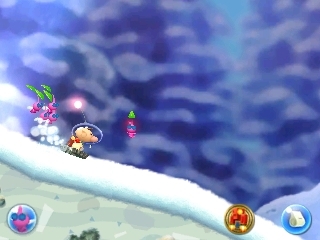 Another creative ice area throws Olimar on a sled and arms him with Winged Pikmin, which he hurls at foes and massive snowballs trying to trample them both. But don’t worry too much if you lose Pikmin along the way, as you can usually find replacements hiding under rocks or shrubbery nearby, and a quick blow of your whistle will send them running your way (failing that, you can summon extra ones using your amiibo). One thing the game does incredibly well is reinforce how much Olimar depends on the Pikmin. Without them, all he can do is walk and hover briefly with his jetpack. That’s it. 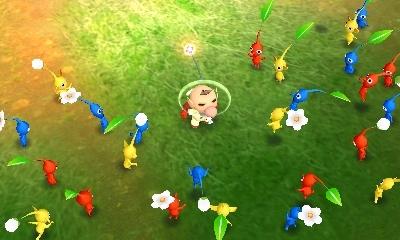 You’re defenseless against foes without Pikmin to hurl at them, and you also can’t pull on leafy levers, push boulders out of the way or myriad other activities. 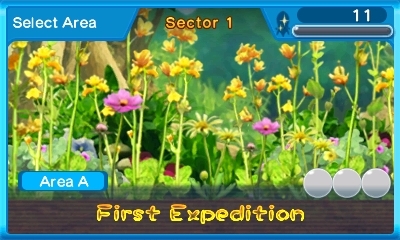 So the game encourages you to keep your Pikmin safe and manage them carefully. 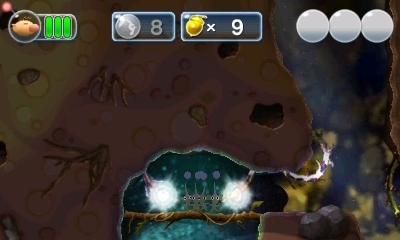 They can get lost if you jetpack away from them, and they can also get destroyed by foes or level hazards. 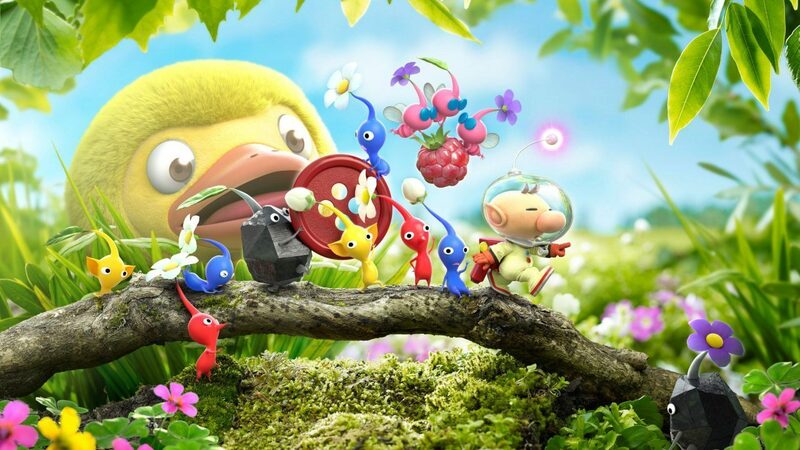 Olimar has to do his best to wrangle them with his whistle, as well as pick the right Pikmin for the job.